In the US many people indulged in an ice cream treat last Sunday as it was National Ice Cream Day. However, the ice cream fun does not stop there because the whole of this month is in fact National Ice Cream Month - a declaration made official by Ronald Reagan 27 years ago when he was in Presidential office. 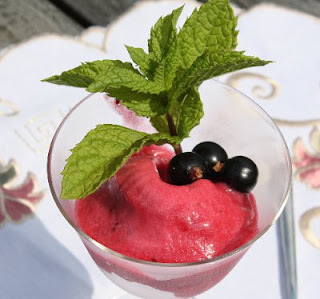 Make your own refreshing ice sorbet - here is a picture of a blackcurrant sorbet I made recently. I picked the blackcurrants fresh from my own garden just minutes before I made it. Served with a few fresh blackcurrants and sprig of apple mint - again all fresh from the garden. Never made sorbet before? Read my ice cream sorbets page.